Tour Dates for 2014 and Reviews From Some Of The 2013 Guests. Sandy lives in Montana and goes to the Pryors many times through-out the year. Experience a camping trip with someone that knows all the horses and the places they may hide. With this trip, you won’t just go to view the horses, you will go to know the horses, hearing the many stories that she shares, making this a once in a life-time experience. If you have a group of 4 and want a private camping tour, contact me for other possible dates. 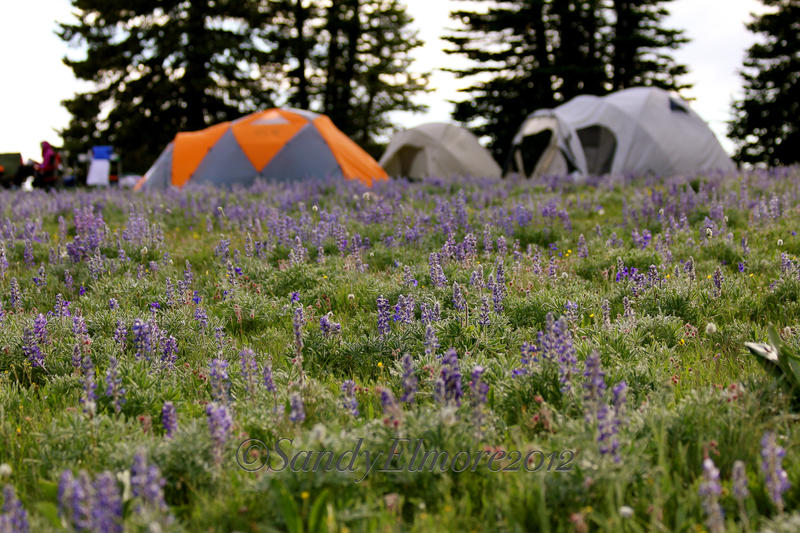 3 Day Camping Tour: July 16- 18th. 1 Opening. 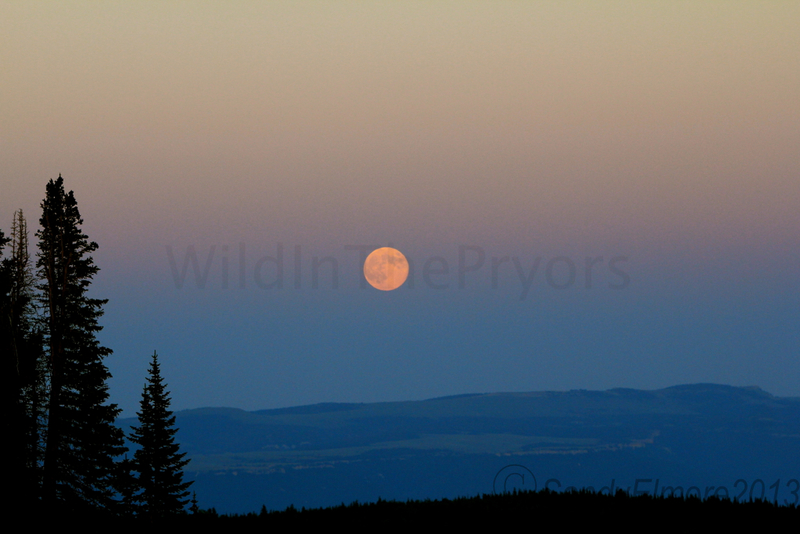 4 Day Camping FULL MOON Tour: September 8-11. Contact Sandy for possible openings. 1. This is wilderness camping. No established camping facilities. Included on all camping trips: All food, snacks and transportation up the mountain and down, along with Sandy’s expert guiding all day long while you are there. If you need camping gear, it can be provided. Trips are limited to 4 guests with Sandy acting as your guide along with her assistant who will be cooking our meals and and offering camp assistance. With Sandy as your guide, you have have the opportunity to look at some of the hidden spots the horses love to go too, and learn about each horse, as Sandy knows each one and their family’s. No Longer available. Contact Sandy for other day-trip options. So whether you want a photography adventure or simply just spend some time with the horses and someone who knows each one, this is the tour for you. Walk alongside Sandy as she checks on the herd and keeps records of each horse. It will be a once in a lifetime experience. Miss you tons, Jeanne, Livingston, Montana. “I wanted to hear the sound of wild horses and experience them in a personal way so I went online to find someone who could possibly give a tour. 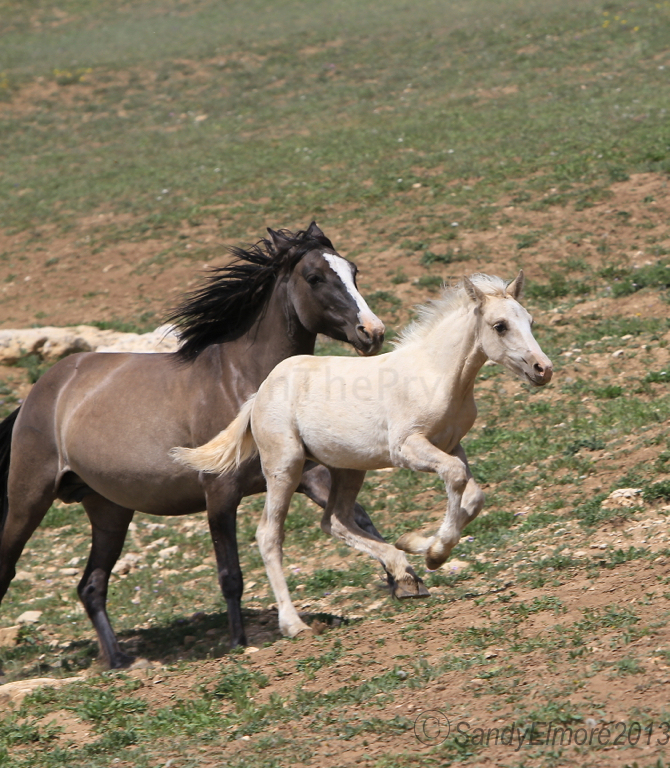 I searched for Wild Horse Reserves and found the Pryor Mountain website. 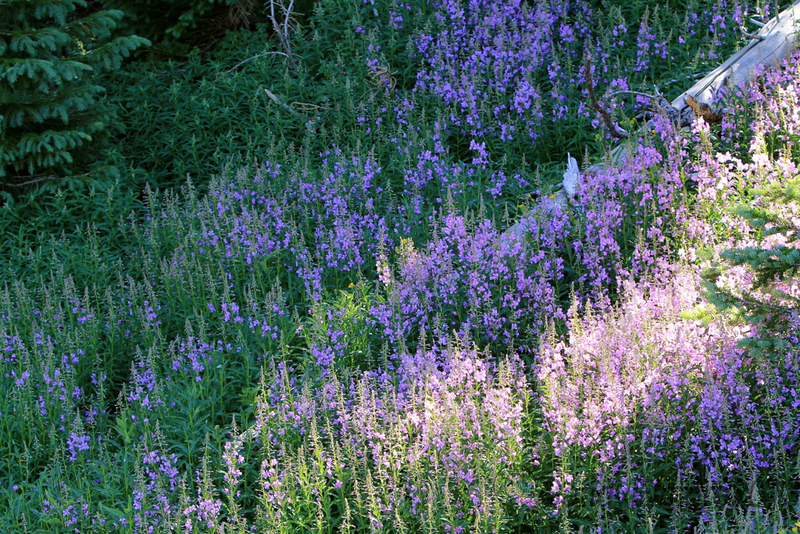 From there, I located a photographer who had her own site called Wild in the Pryors. After viewing her photos of the horses and discovered how she cared about them and had gotten to know the so personally, I wrote her an email and asked if she ever gave tours on the mountain. After I found out that she did and also offered an overnight option to camp on the mountain, I booked a trip with her. This was a trip I will never forget as I’m from Seattle and don’t have wild horses here. 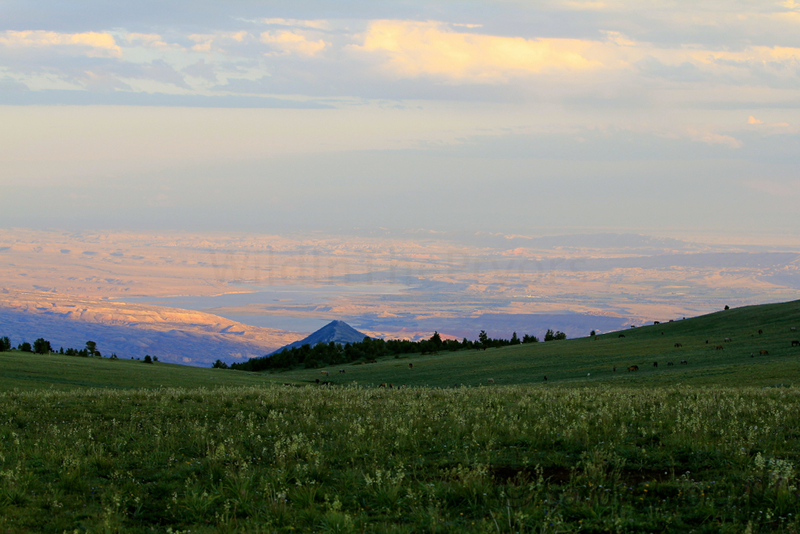 I drove to Wyoming and met up with Sandy and a small group and we camped on the mountain. I will never forget the view outside my tent of the sky and the valley below. 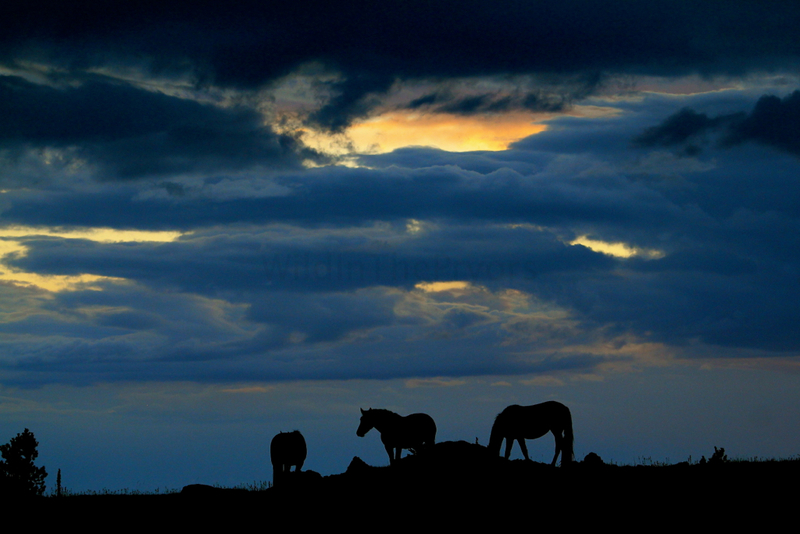 Being on top of the mountain offered cooler summer temperatures and thunder storms and if that wasn’t exciting enough, to lie in my tent and hear horses thundering by in the dark, was an experience that made me realize that life is precious in the moment. I learned about horses and how they lived in the wild. “I want to write a big “Thank you!” to Sandy Elmore at “Wild in the Pryors”. 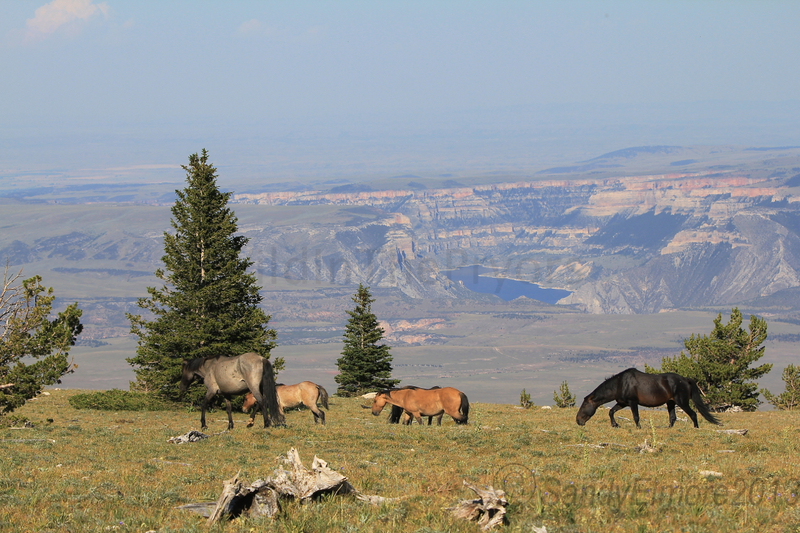 Early this year, my cousin came to me with an opportunity she found to observe the Pryor Mountain Wild Mustangs for three days with a guide, food and tents included. I enthusiastically said “yes!” not really knowing what I was agreeing to do. I came to the Pryor Mountains only knowing two of the Stallions’ names but I came home with a wealth of information about the different Band Stallion’s characteristics, band and herd dynamics, names of all the stallions, mares and foals, mountain terrains, vegetation, and challenges the Pryor Mountain Mustangs face. The trip was educational, entertaining, and heart felt. The Mustangs became more than a reference or a story to me, they made an impact on my perspective about my own horses and my life. Sandy is a wonderful and patient teacher as I asked multiple times “Now which horse is that?”, she explained in detail all about each of the bands and the horses, their families and how they interact with each other. It is an experience I will always treasure and hopefully repeat annually. 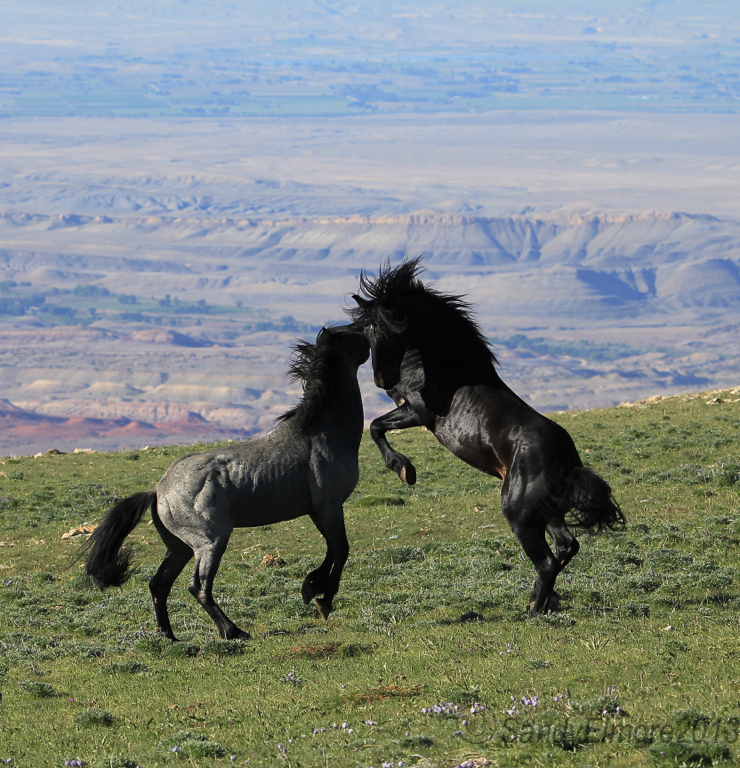 “Our trip with Sandy and Amber to see the Pryor horses, wild in their native mountain habitat, was a dream come true for me. Sandy has carefully planned every detail of the tours: comfy transportation, good food and camping supplies, if needed. 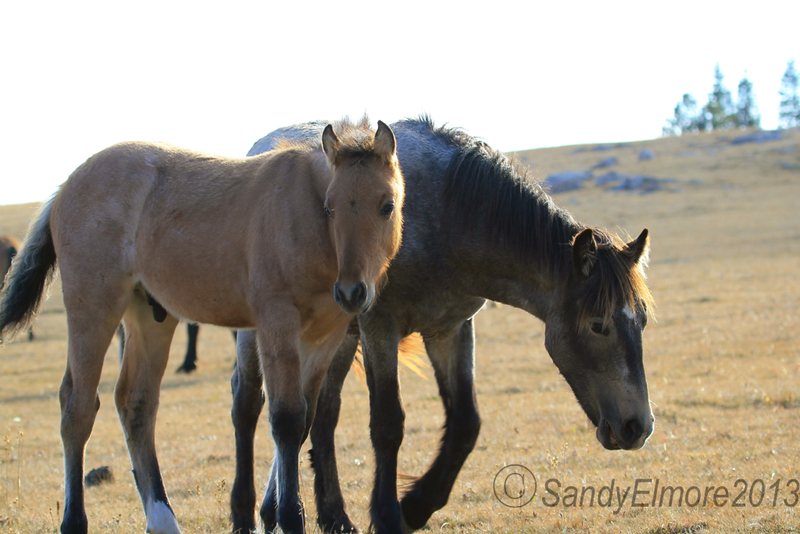 With Sandy’s years of studying the Pryor horses, raising her own horses including her three adopted Pryor horses, her knowledge of each horse on the Range, their behavior patterns and family interactions, you not only see the horses, but learn about them as the individuals they are. She provides her guests with an up-to-date reference list of the horses with information for identifying each horse. After our July tour with her, we were so thrilled we tried to book another tour in September, but she was booked up, so we are looking forward to her tours next season. Sandy will treat you like a welcome friend to assure you have the ultimate mountain top experience — as we did. I got to know this wonderful woman named Sandy through her blog on www.wildinthepryors.com. I really enjoy reading her blog because they are very informative. During several phone conversations, Sandy invited my wife and I several times on one of her tours up the mountain with her however it never worked out. 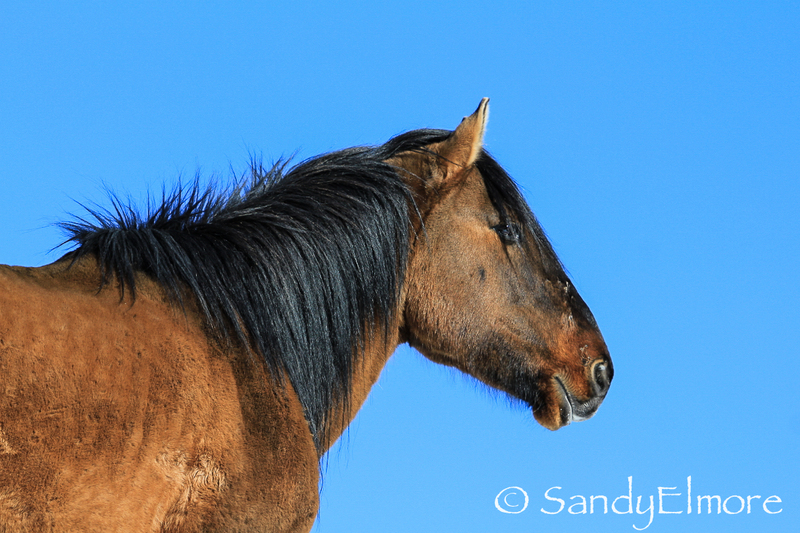 A while ago I spoke with Sandy, she once again invited us on her tour so we jumped at the chance not only so we could meet Sandy face to face but also to travel up the mountain with someone who really knows and understands these horses. Sandy set up the accommodations at Fort Causeway which really is the ideal place to overnight. This is where we met Sandy and her daughter, Amber for the first time. During the scenic tour up the Mountain, Sandy stopped several times to point out various things out that we would have missed travelling up ourselves. The trip up the mountain didn’t seem to take that long because there was a lot to see and had great company. At the top of the mountain it was amazing to see all the horses in their true natural terrain with their beautiful summer coats. It’s hard to describe the natural colors of these amazing horses. 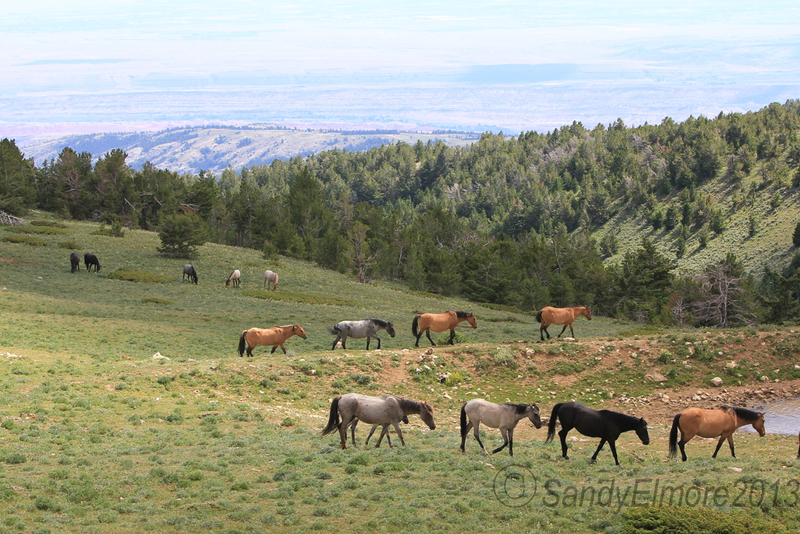 As we drove around, Sandy is very knowledgeable about the horses and their surroundings. Many times I would ask who that particular horse was and with no hesitation, she would provide the details of that horse and family. She knows each and every detail of the horses including the new colts. She was quick to point out watering holes, trails the horses travel on and places the horses like to graze during the days. Sandy shared so much information on this journey and gave me a new appreciation for these horses. The day with Sandy and Amber was one we will never forget. We had so much fun and shared so many stories while making lots of memories on this Pryor Mountain journey. I would recommend this opportunity to anyone who loves horses. Thanks again Sandy and Amber for the wonderful time we had together. The Wild in the Pryors Tour was a dream come true! I simply cannot thank you enough for this amazing experience and all of your knowledge you so graciously shared. I have followed the Pryor Mountain horses for many years now so I came with a voluminous list of questions in hand developed over the years; you were so patient and kind in answering ALL of them. 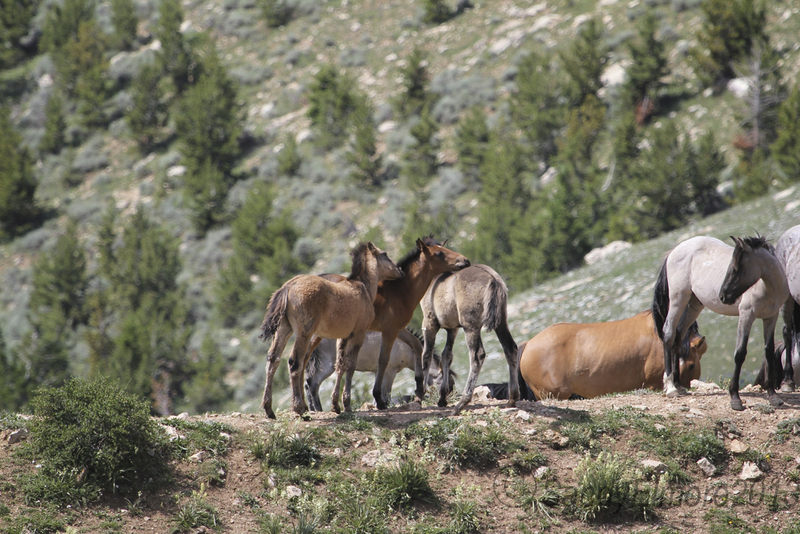 It was an added bonus to learn from you about the herd dynamics, the mountain seasons, the range history, and what the future may hold for these magnificent horses. Thank you for granting my “Bucket List Wish” of being able to see the Pryor Mountain Horses up close and personal. I never dreamed I would be able to take such a unique camping trip, let alone have the benefit of a friendly, knowledgeable guide who is an awesome cook! Sandy, I especially want to thank you for all you do for the horses and always being “their voice” through the good and bad times. You are their champion! 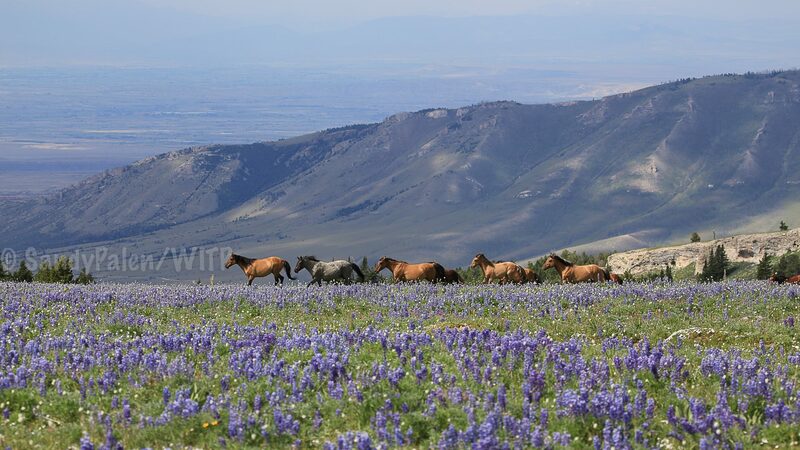 Wild in the Pryors is permitted by the Bureau of Land Management to conduct group tours within the Pryor Mountain Wild Horse Range from January to December. Wild in the Pryors is one of a handful of businesses that have the federal permits necessary to guide clients onto this federal property. Sandy is also licensed to give tours within the Bighorn Canyon National Recreation Area. Contact Sandy for reservations or more information. Awesome..and I am in total agreement with you Linda! 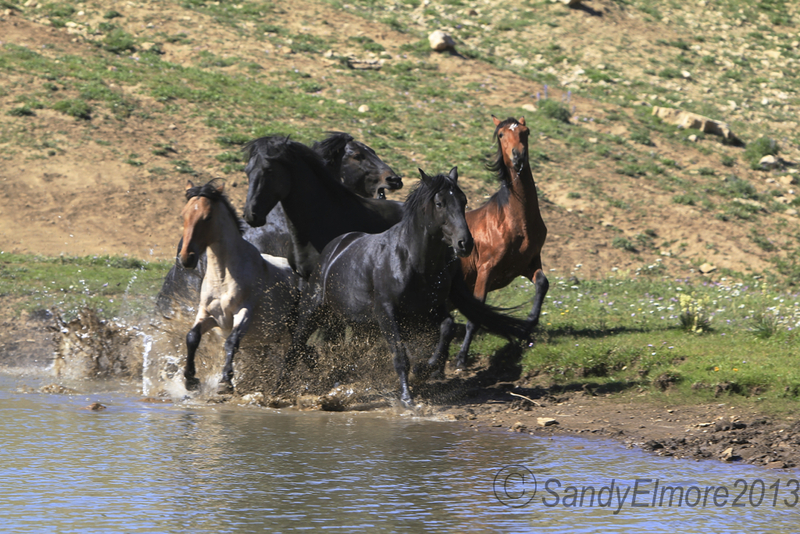 Thank you Sandy, I look forward to your visits and more time with you, Amber and the wild horses on the Mountain! Although I am not one who has taken your tour (I live here) I was included in your “dry run” and it was exceptional. I treasure your friendship, and I appreciate your knowledge, experiences and photos that you share! 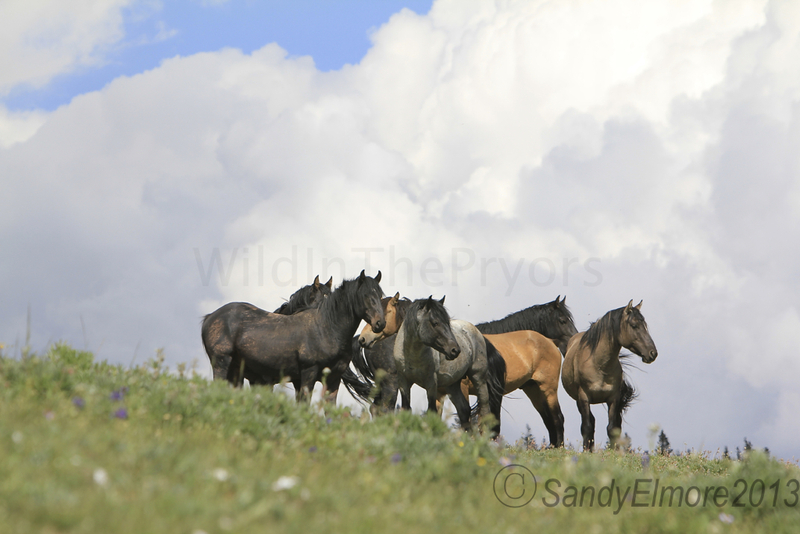 A HUGE THANK YOU from me and the Wild Horses!!!! Thanks Lori! I always enjoy spending time with you on the mountain (and off) too!